Kotzebue Electric Association’s overall goal for this project is to demonstrate diesel-off configuration for a remote wind-diesel high penetration hybrid power system through the retrofit of existing equipment and controls. The scope of work will for this project will include upgrading the controls and monitoring of the Wales system, as well as restoring the two Entegrity turbines. The Wales Wind-Diesel Hybrid Power System was intended to demonstrate the feasibility of retrofitting a village power plant with a high penetration wind-diesel system which allows the community to realize large reduction in diesel consumption. It is one of very few systems in the world which can operate with the diesel off for extended periods of time. The system is in need of upgrades so that research can continue. In 1995 the Alaska Energy Authority (AEA), Kotzebue Electric Association (KEA), Alaska Village Electric Cooperative (AVEC), and the National Renewable Energy Laboratory (NREL) implemented a high penetration wind diesel hybrid power system to reduce diesel consumption for Alaskan communities. This project was intended to be a technology demonstration and a pilot project for commercial replication in other Alaskan communities. Funding was provided by the U.S. Environmental Protection Agency, the U.S. Department of Energy, the Alaska Science and Technology Foundation, as well as KEA and AVEC. NREL created the control systems which were required to integrate system components. KEA and AVEC provided project management including site selection, permitting, and wind resource assessment. The project was commissioned in Wales in the spring of 2001. Low and medium penetration systems are, at this point, a mature technology. High penetration systems, however, still have many problems - especially when installed with the capacity to operate in a diesel-off capacity. There are no such high penetration wind diesel systems with an average load of over 300kW in the world. Alaska has two high penetration systems, including the system installed at Wales as well as a TDX system installed at Saint Paul Island. The Wales system is composed of two Cummins LTA10 diesel gen-sets, one Allis-Chalmers 3500 diesel gen-set, two 65-kW Entegrity wind turbines, an AC/DC rotary power converter, a 130 Ah SAFT NiCad battery bank, two electric boilers (one local and one remote) serving as secondary loads, and a Programmable Logic Controller (PLC)-based main system controller. The system was designed to have an original capacity factor of 57.5% and utilizes short term energy storage to ensure power stability. The system has degraded in functionality over the past eight years and upgrades are needed including installation of remote access for monitoring and control, increased data logging, and other updated equipment. A new system design, and plan for upgrading the communication system and repairing the existing wind turbines is proposed. There are currently problems with the wind turbine controls causing the turbines to be offline for two years. The local operator is also nervous about running the system, due to the risk of a blackout. Installing remote operating ability will help to overcome this. There are currently system controller (SCAD A) issues that need to be addressed, and the system programming will need to be updated to allow for better remote communication and design. The system was initially designed by NREL, but the original system has undergone many changes, including great improvements in controller design. Better programming and communications will allow the system to run as it was initially envisioned, allowing problems to be diagnosed before a blackout occurs and making troubleshooting and health maintenance possible. The ultimate goal of this project is to revive the wind diesel system in Wales, Alaska so the community can achieve a 50% reduction in diesel consumption. In doing so, the diesel-off configuration can then be replicated in other communities. Wind-diesel power systems can vary from simple designs, where wind turbines are connected directly to the diesel grid with a minimum of additional features, to more complex systems. Two overlapping concepts define the system design and required components: the amount of energy that is expected from the wind system (system penetration) and the decision to use thermal loads and/or a storage device to remedy system energy fluctuations. Given today’s technology, these issues are usually determined by the system designers as a starting point for overall system design. These concepts are described in the following section. A classification system is used when discussing the amount of wind that is being integrated onto the grid system. A system is considered to be a high penetration system when the amount of wind produced at any time versus the total amount of energy produced is over 100%. Low penetration systems are those with less than 50% peak instantaneous penetration and medium penetration systems have between 50%-100% of their energy being produced from wind at any one time. Low and medium penetration systems are a mature technology. High penetration systems, however, still have many problems, especially when installed with the capacity to operate in a diesel-off mode. Although demonstrated on a commercial basis, high-penetration wind-diesel power systems require a much higher level of system integration, technology complexity, and advanced control. 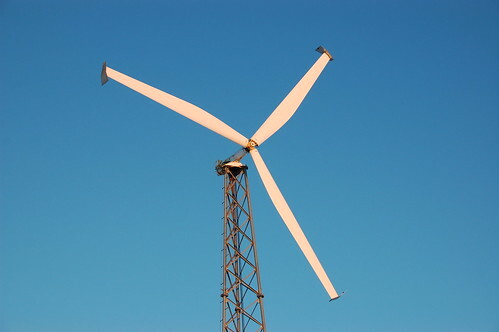 The principle of high-penetration systems is that ancillary equipment is installed in addition to a large amount of wind capacity (up to 300% of the average power requirements), so that the diesel can be shut off completely when there is an abundance of wind power production. Any instantaneous wind power production over the required electrical load, represented by an instantaneous penetration over 100%, is supplied to a variety of controllable secondary loads. In these systems, synchronous condensers, load banks, dispatchable loads (including storage in the form of batteries or flywheel systems), power converters, and advanced system controls are used to ensure power quality and system integrity. Spinning reserve is created through the use of short-term storage or the maintenance of a consistent oversupply of renewable energy. Although these systems have been demonstrated commercially, they are not yet considered a mature technology and have not been demonstrated on systems exceeding a 200 kW average load. Wind-diesel systems that employ the high-penetration system are operating in St. Paul and Wales. Because of the large overproduction of energy, high penetration wind-diesel systems are economically feasible only if there is a use for the additional energy generated by the wind turbines. In the case of Alaska, this extra energy can be used to heat community buildings and homes (thermal energy), displacing fuel oil. Another use could be to power electric or hybrid cars, ATV’s, and snow machines. Until recently, it was assumed that high penetration wind-diesel systems without storage were only theoretically possible. This is no longer the case. Commercially operating short-term storage and "no storage" systems have been installed in recent years, demonstrating that both technology choices are viable. In systems incorporating storage, the storage is used to cover short-term fluctuations in power. During lulls in wind generation, the battery bank or other storage device supplies any needed power. If the lulls are prolonged or the storage becomes discharged, a diesel generator is started and takes over supplying the load. Studies have indicated that most lulls in power from the wind are of limited duration, and using storage to cover these short time periods can lead to significant reductions in the consumption of fuel, generator operational hours, and generator starts. The storage system does not necessarily need to be able to carry the full community load, since in larger systems the storage is only used to smooth out lulls in wind energy or to buy enough time to start a standby generator. In these cases, the storage capacity should be approximately the same size as the smallest diesel and have an accessible capacity up to 15 minutes. In wind-diesel applications, the requirements for storage systems will depend on local wind resources, the costs of different components, capacity and power response times, and the power system performance required. Different storage options are discussed in a separate section of this report, but care should be taken to ensure that the storage technology selected meets the specific needs of the particular wind-diesel application. All high-penetration systems, with and without storage, have been installed in northern climates where the extra energy can be used for heating buildings or water, displacing other fuels. In these systems, it may be wise to install uninterruptible power supplies (UPS) on critical loads. Although only a limited number of systems have been installed, the concept is economically attractive and has the potential to drastically reduce fuel consumption in remote communities in Alaska. KEA and AVEC engineers will review and recommend system improvements to the power plant, conducting a review of system performance. KEA and AVEC technicians will accompany the engineers to evaluate the system in its entirety to ensure that system relaying and protective controls are operational and to upgrade the wind turbine programming and systems, installing the most current components. A report will be produced specifying necessary work to allow Wales to operate in a diesel-off mode. Purchase and install new radio links at the power plant, school, and wind site; a dedicated satellite connection for the power plant; new PLCs for the energy storage system, school heating system, power plant, and wind site. Other work may include replacing the existing servers at the power plant and the wind site. Equipment will be ordered after the initial review, to be installed in Wales upon arrival. After the equipment is installed, data collection will begin. The SCADA system at Wales is to include a system allowing for real time monitoring and remote control of the turbines and interconnections with the turbine controllers. Concurrent data collection from met tower sensors will measure numerous power quality parameters including real and reactive power, voltage, and current on each phases, voltage and current total harmonic distortion, frequency deviation, and voltage imbalance. This data will be collected, analyzed, and reported on a monthly basis throughout the duration of this proposal by KEA, AVEC, or another entity of their choosing. As system performance is studied, further recommendations will be made as needed to optimize the operation of the system. This project is a Denali Commission EETG Program project. The funding goal of the EETG program is to develop emerging energy technology that has the potential of widespread deployment in Alaska and has the long-term goal of reducing energy costs for Alaskans. Kotzebue Electric Association is a rural electric utility cooperative, based in Kotzebue, Alaska. KEA has 840 members, and generates over 18 million kilowatt hours per year. The Alaska Center for Energy and Power (ACEP), an energy research group housed under the Institute of Northern Engineering at the University of Alaska, Fairbanks, is serving as the program manager of the EETG solicitation. As the projects deal with emerging energy technology and by nature are high risk, high reward, ACEP’s technical knowledge and objective academic management of the projects, specifically for data collection, analysis, and reporting, is a vital component to the intent of the solicitation, i.e., providing lessons learned and recommendations. Alaska Village Electric Cooperative will share in the work of reviving Wales. This will include time for an AVEC engineer. AVEC has significant experience with wind-diesel systems and now has over 2 MW of installed wind capacity in over 5 communities.